As a woman, there are few things worse than being stranded alone on the side of the highway with a broken down car and no knowledge about how to fix it. While women often get stereotyped as not being car-savvy, the truth of the matter is that many men have just as little, if not less, car knowledge. Regardless, preparing and preventing is always better than repairing and regretting. The basic car maintenance tips we’ll share below are applicable to everyone, but we’ll look at them from a woman’s perspective. It doesn’t matter if your car runs perfectly if the inside of it is an absolute mess. If you’re a mom, keeping it clean is probably the least of your worries, but you may benefit on a Saturday from giving the kids a little reward if they clean the car. They’ll learn responsibility and you’ll get a clean car. If you’re a single gal, keeping the car clean just takes a small effort each day. Little things like throwing away that yogurt cup or getting rid of those unneeded receipts can go a long way if you do them on a regular basis. Find a fun car air freshener to keep things smelling nice, and vacuum occasionally. Oil is essential to a high functioning car. Running out of oil can cause severe problems for your motor. It’s a good idea to check your oil at least once a month. To do so, simply pull out the dipstick, clean it off with a paper towel (keep some handy in the glove box), dip it in again, and then pull it out. At the very bottom of the dipstick, you’ll likely see a little textured part with an “F” and and an “L” for “full” and “low.” If you dip and the oil reaches somewhere in between the “F” and “L,” you should be good. If you’re getting low, pull out your owner’s manual or ask Google which type of oil you need for your specific make and model and purchase it at the closest auto parts store. Changing your oil is different than checking your oil levels and refilling. The color of your oil can sometimes help you know when you need to change it, but the best rule of thumb is just to follow the mileage recommended by your local auto shop. If you get an oil change, almost all auto shops will give you a little static cling sticker in the upper corner of your windshield that will tell you the exact mileage at which you’ll be due for a new oil change. Simply compare your odometer to that number and get in to get your oil changed. Don’t go over the miles suggested as you could burn your engine up. First, you’ll want to make sure your hazard lights are on and that you’re on even ground. Next, ensure the parking brake has been applied. Third, stick wheel wedges behind the wheels (if your kit has them) that will maintain contact with the ground. Fourth, take off the hubcap. Fifth, slightly loosen the lug nuts. It’s important to do this while the wheel is still on the ground. Sixth, place the jack under the vehicle. Seventh, raise the vehicle with the jack. Take a look at your owner’s manual to see exactly where to position it. Eighth, unscrew the lug nuts completely. Ninth, remove the flat tire. Tenth, mount the spare tire. After this, you’ll want to tighten the lug nuts as tightly a you can and then lower gradually until the tire is barely touching the ground. Next you’ll tighten a bit more. Finally, you’ll lower the car so all the weight is on the tire. Give the lug nuts a final tighten and you’re good to go. •Most spare tires are only meant to help you get by until you can get a real tire, so they won’t have a hubcap and they may look a little funny. Spare tires aren’t meant for high speeds or high mileage, so get to a tire shop and change the tire as soon as reasonably possible. •It might be a good idea to keep gloves in the trunk so you don’t get your hands filthy. A rain poncho and a flashlight might come in handy as well. 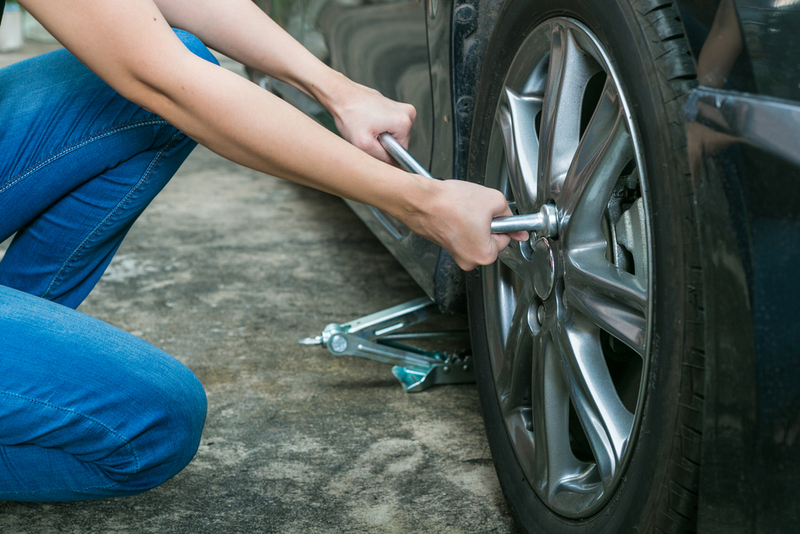 •Practicing changing a tire at home is a really good idea so that if it ever happens when you’re out there on the road, it won’t be your maiden voyage. •There are awesome tutorial videos online that’ll take you through the steps in as little as three minutes. To avoid ever having to change your tire in the first place, there are some basic tire maintenance tips you’ll want to know. First is that low tire pressure can not only hurt your gas mileage, but it can also put unnecessary strain on your tires, causing them to lose additional air and even become completely flat. Usually your tire pressure light will come on when there’s an issue, and adding air is easy to do at a gas station; many tire places will even do it for free. Second, proper alignment is crucial. If your tires aren’t properly aligned, the tread can wear down very rapidly causing the tire tread and walls to become thin and be in danger of exploding. Third, regularly rotating your tires can ensure that all get equal wear and tear and that no one tire takes too much strain. While there are several other things you can do to keep your car running well, tires and oil are arguably the most critical. Keeping your car on a proper maintenance schedule and practicing the basic maintenance tips outlined above is the best thing you can do to stay safe out there on the road and prepare for emergencies. If you’ve practiced changing a tire before your tire ever blows out, you’ll be prepared if and when it does. And remember that if you keep your oil clean and levels high, your engine will run smoothly and the chances of breaking down on the side of the road will greatly diminish. Also, just remember that no matter how safely you drive, people around you may drive poorly. Be prepared by taking an online driving course that will help you drive defensively. Get started on learning these maintenance tips today and enjoy the journey!